»What is Dementia vs. Alzheimer’s? According to the staff at the Mayo Clinic, dementia isn’t a specific disease. Instead, dementia describes a group of symptoms affecting intellectual and social abilities severely enough to interfere with daily functioning. 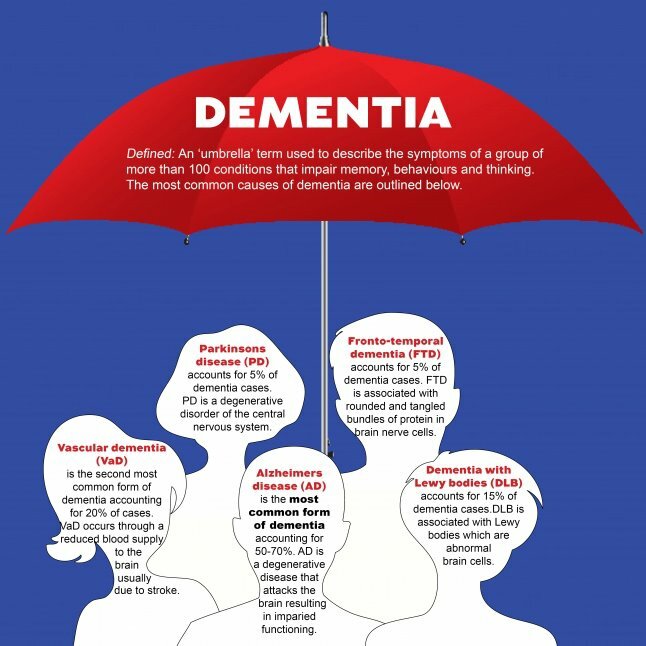 Many causes of dementia symptoms exist. Alzheimer‘s disease is the most common cause of a progressive dementia. Memory loss generally occurs in dementia, but memory loss alone doesn’t mean you have dementia. Dementia indicates problems with at least two brain functions, such as memory loss and impaired judgment or language. Dementia can make you confused and unable to remember people and names. You also may experience changes in personality and social behavior. However, some causes of dementia are treatable and even reversible. What are some signs and symptoms of dementia? In general, dementia is a collection of symptoms including memory loss, personality change, and impaired intellectual functions that results from disease or trauma to the brain. The changes are not part of normal aging and are severe enough to impact daily living, independence, and relationships. The progression and outcome of dementia vary, but are largely determined by the type of dementia and which area of the brain is affected. Diagnosis is possible through advanced brain imaging, clinical examinations, and diagnostic testing. However, in many cases, it may not be quickly diagnosed. If you notice something is wrong, keep trying until you find a doctor that can assist you and your loved ones in finding the cause of the things you are noticing.